Includes: Jumpsuit, Neckpiece, and Capelet. Get ready for thrilling dance night after wearing Elvis Presley costume. Revive 1970s era and dance in style like Elvis Presley in this amazing costume. Elvis Presley was a legend of American pop culture with millions of fans. We got a very clever and comfortable costume idea for you. Just keep scrolling down and you will see it soon. Dressing up for a costume party is not a hassle anymore because you got what you loved most all the time. 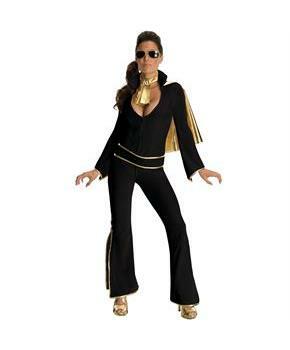 Your wish to look charming and fabulous will become reality in Elvis Black Adult costume. Care Instruction: Hand Wash. Cold Water. Do not Bleach. Dry Flat. Do not Iron.